2016 has been an amazing year here at Design Cuts. From the successful launch of our new marketplace, to our fun-filled third birthday event, it’s been a blast! Our community continues to be at the very heart of everything we do. We are truly grateful for each and every one of you! Today, we’re thrilled to bring you an exclusive end-of-year celebration bundle, for just $1! This is our way of saying thank you for an amazing year. 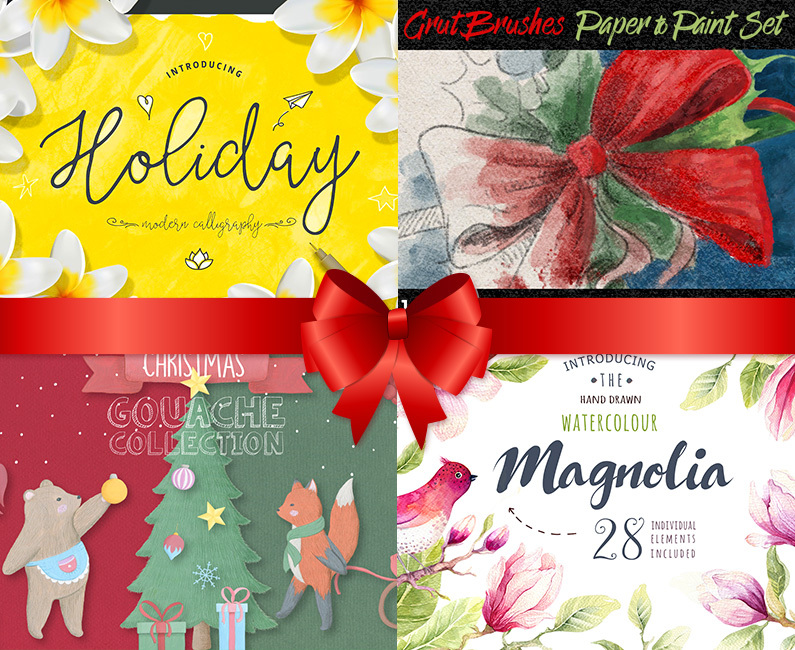 The lovely designers involved in this bundle have very kindly agreed to offer these incredible products as their gift to the Design Cuts community. The $1 bundle price helps us to cover the cost of hosting this bundle. Once again, thank you for being part of Design Cuts and happy holidays from our whole team! This bundle brings you a range of popular fonts (5 in total! ), graphics, effects packs, brushes and more! 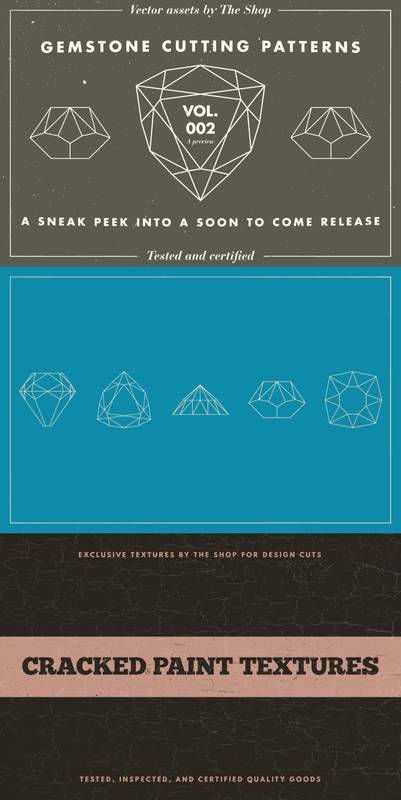 Everything you need to level up your design work can be found inside this exclusive festive offering. Thanks to Vintage Type Co. for participating in this $1 bundle. Introducing the All-In-One Vintage Font Family, Grindstone! Grindstone is a new vintage inspired font family that consists of three distinct, and complementary fonts. A sans serif, a script, and a big bold display serif. Perfect for branding, print media, web projects, and so much more, each font comes equipped with multilingual support and tons of character. Grindstone Script also comes packed with OpenType ligatures to ensure smooth transitions between letters, as well as decorative swashes. Don’t go searching for the perfect font combinations! Just pick up the Grindstone Font Family today! Thanks to Blessed Print for participating in this $1 bundle. Click here to visit their store. 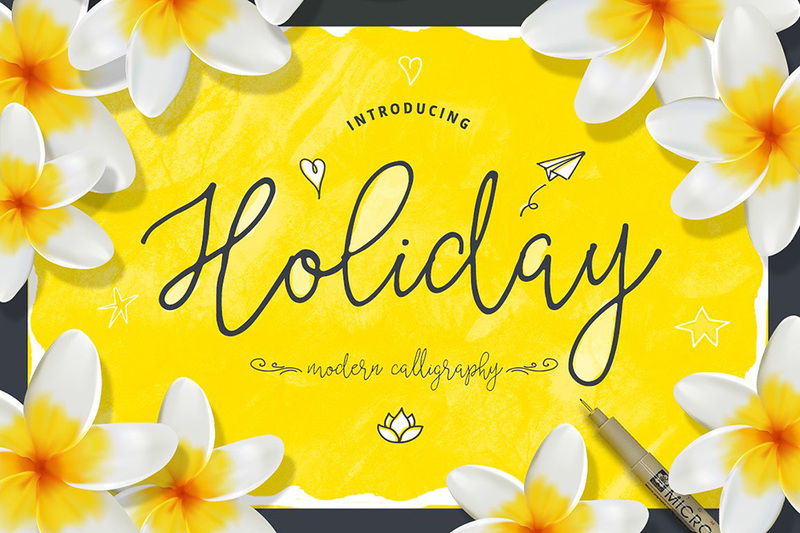 Holiday script is a playful monoline typeface which was originally drawn on paper. This modern calligraphy script will fit perfectly many sans fonts to achieve a fresh view. Holiday script comes in two weights (regular and bold). Thanks to Radomir Tinkov for participating in this $1 bundle. Click here to visit his store. Introducing Maya Script! A slim and beautiful font with personality and character. It comes in three weights – Regular, Bold and Ornaments! The simplest way to create beautiful designs, a special Card or Invitation, everything that you could imagine can happen. Maya Script is also suitable for almost every design project – from packaging, editorial and branding. A wide range of Latin Based languages are supported – Basic Latin, Western European, Central European, South Eastern European. Thanks to Get Studio for participating in this $1 bundle. Click here to visit their store. Enchanted Brush is a new fresh & modern handbrushed script with a beautiful calligraphy style and dancing baseline! So real ‘hand lettered’ look. Perfectly to make your designs such as invitation greeting cards, branding materials, business cards, quotes, posters, and more! Enchanted Brush comes with 475 glyphs and has given PUA unicode (specially coded fonts). The alternative characters were divided into several OpenType features such as Stylistic Alternates, Stylistic Sets, Contextual Alternates, and Ligature. The OpenType features can be accessed by using OpenType savvy programs such as Adobe Illustrator, Adobe Photoshop CC, and Adobe InDesign. Thanks to Without Foundry for participating in this $1 bundle. The italic versions of each weight are not included in this family, only the upright weights. Thanks to GrutBrushes for participating in this $1 bundle. 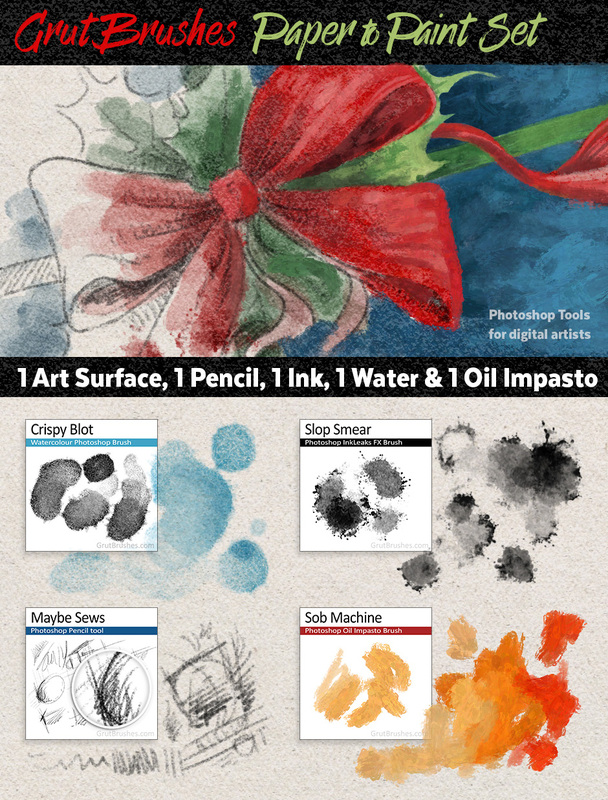 A compact Digital Artist’s kit to take you from a pencil sketch to a finished oil painting, all in Photoshop. Included are four professional, pressure responsive digital artists brushes from GrutBrushes and an Art Surfaces .PSD paper template which magically adds paper texture and lighting effects to your artwork as you draw and paint. Installation instructions are included in a .PDF. Thanks to Daily Texture for participating in this $1 bundle. 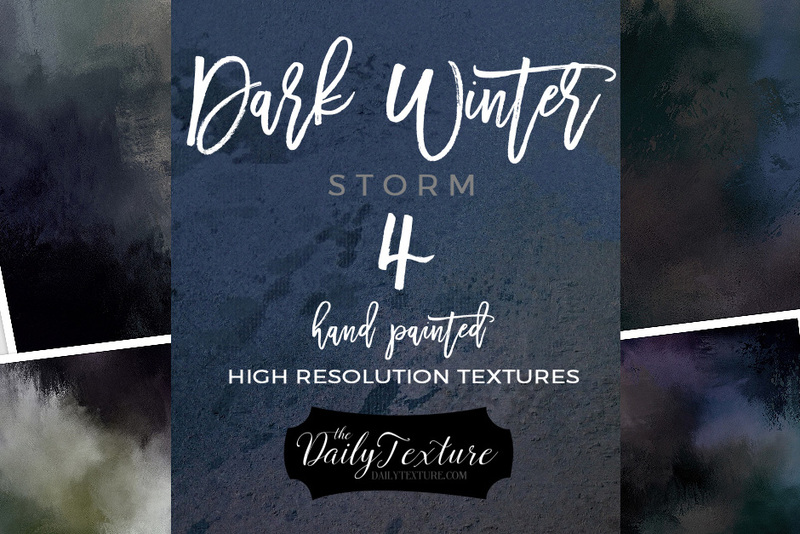 The Dark Winter Texture Collection features 4 hand painted textures with glorious, deep, rich shades from a dark winter night. Use these textures “as is” to add a painterly feel to your photographs. Using your transform tool in your software, you can stretch them and position them exactly where you need them for your art. You can also use these textures as overlay layers to enhance existing photos or to add unique color tones throughout your artistic images. These also make wonderful beginning backgrounds for your digital paintings! Thanks to Twinbrush for participating in this $1 bundle. Colour Double Exposure effect template for Photoshop. Easily create stunning colour double exposures with just a few clicks! Using smart objects, simply double click and replace the images with your own to instantly create breath taking colour double exposures. Feature packed .PSD files then allow you to customize colours and effects and add texture to make some seriously amazing imagery! This is not a Photoshop action, but a more flexible and versatile option containing two high resolution .PSD files; one landscape and one portrait orientation. 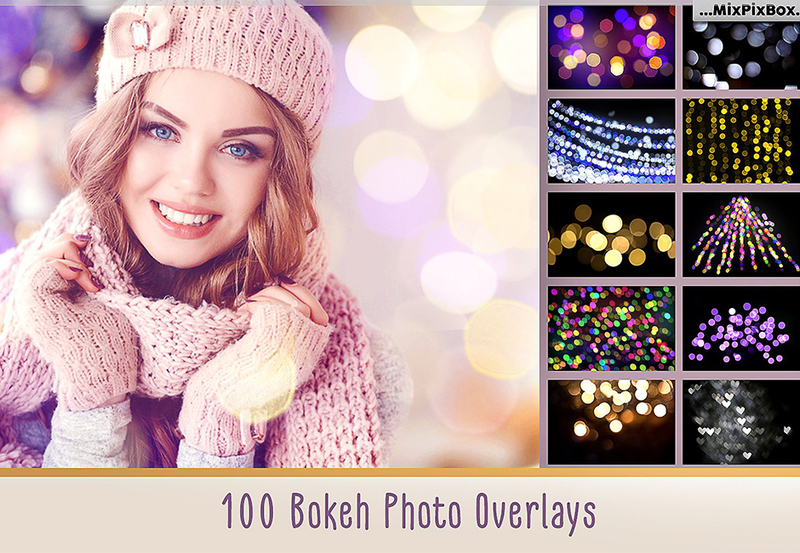 Please note: Stock photographs used for previews are not included with the .PSD file. Thanks to Unio for participating in this $1 bundle. Click here to visit their store. Conceived to give a handmade letterpress look to your fonts, logos or shapes, “Gutenberg – Letterpress Action” represents the ultimate kit to quickly texturize your design in a matter of seconds. Composed by 1 Graphic Styles and 1 Adobe Illustrator Action, this kit is meant to be user-friendly since no particular tweaks are required. Follow our extensive visual guide to get amazing results. Unio blinks even to exigent users with an advanced guide, useful to fit the final result to your custom needs. Thanks to The Artifex Forge for participating in this $1 bundle. Click here to visit his store. Drawing letters by hand is indeed hard and that’s why I created these amazing brushes, to make the process much easier. They are the next best thing to having your own in-house typographic artist! They are perfect for drawing too. The brushes have subtle texture which follows the line of the text as it would on real hand-drawn typography. Using a hand-drawn font works well for small pieces of text but when it comes to headlines, the extra texture gives these brushes the edge. Plus, drawing the text yourself will feel like a much bigger achievement! Thanks to The Shop for participating in this $1 bundle. Click here to visit their store. This set of 20 textures has been captured from an old house in my neighbourhood. The house has seen better days, and many of its surfaces could use a fresh coat of paint. What is left of the original paint job is in various states of decay, with amazing cracks, scuff marks, and cracks showing all the way through. These five assets are a sneak peek of things to come. Over forty more gemstone related elements are on their way, and you’ll be the first ones to have a look at them, and to use them. As usual, the final pack will feature each asset in multiple file formats, in clean and aged versions etc. The files included (Illustrator CC, Illustrator CS6, Illustrator CS3, .EPS, and .PDF) will allow you to use the assets in virtually any creative software. These four textures have been captured at an old cement pier that sits on the coast of Lake Erie, in Cleveland, Ohio, USA. Battered by the elements, and by countless tourists that want to get a sense of the power of wind and water, the surface of the pier features fantastic textural details. 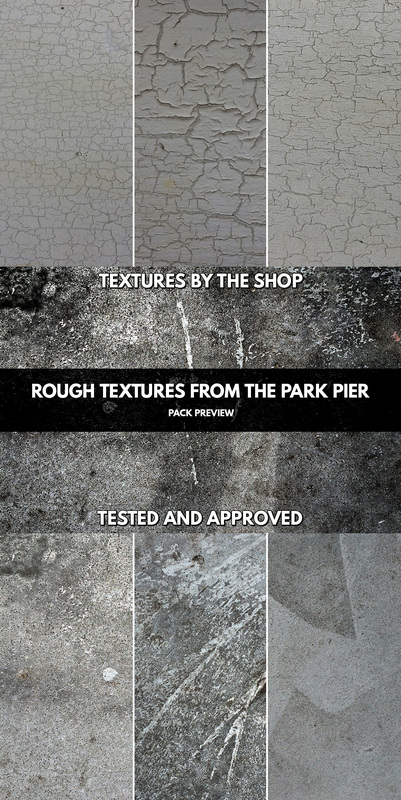 These rough textures will be perfect for weathering, masking, and any other operations where grit is required. These textures are a sneak peek of the full set, to be released soon. Thanks to 2 Lil Owls for participating in this $1 bundle. Click here to visit their store. Thanks to Julia Dreams for participating in this $1 bundle. Click here to visit her store. This is my very Christmas gouache collection! These elements are ideal for your Christmas postcard or poster. Or if you want to decorate a pillow or make a holiday card, add these beautiful animals and other Christmas elements to create an invitation or t-shirt! Thanks to Vector Hut for participating in this $1 bundle. Click here to visit their store. Introducing Our Second Collection of Vintage Plant and Flower Vector Illustrations – includes 35 High Quality .PNG and Vector Images. Our focus is to collect, restore and repurpose old and forgotten artwork for the modern creator and within this collection, you will find 35 detailed plants and flower engravings/illustrations that are perfect for a whole variety of design projects. Each illustration within this gorgeous pack started its life inside a beautiful 1891 botanical book found in our private collection. Scanned at 1200dpi, restored and repurposed, these illustrations will now live on forever. This set includes the following plants and flowers – Aster, Balsam, Blue Lobelia, Blue Sage, Browallia, Canary Flower, Canterbury Bell, Christmas Rose, Columbine, Commelina, Common Marigold, Crimson Flax, Crimson Petunia, Everlasting Pea, Fuchsia, Gladiolus, Honeysuckle, Indian Pink, Iris, Jessamine, Lavender, Marigold, Martagon Lily, Michaelmas Daisy, Monkshood, Phlox, Rudbeckia, Snowdrop, Striped Petunia, Sweet Dea, Virginian Stock, Wallflower, White Lily, Winter Jasmine and a York and Lancaster Rose. Thanks to Eclectic Anthology for participating in this $1 bundle. 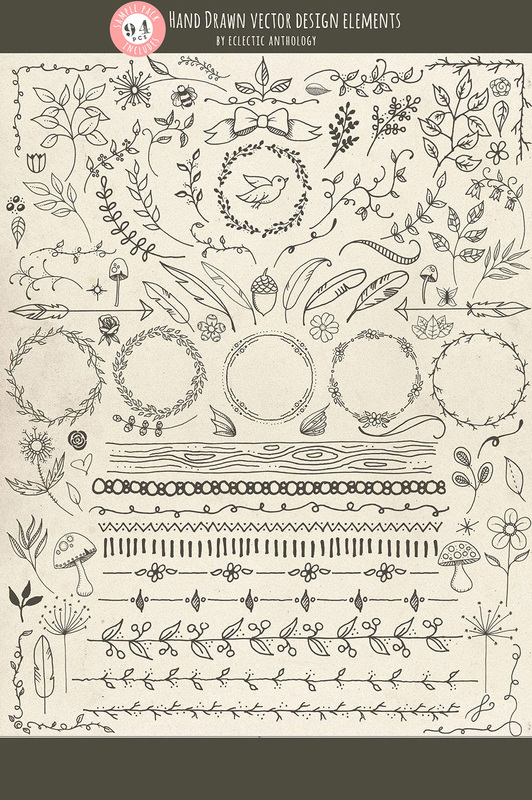 In this sample, you get 94 of the 300 ‘Woodland Whimsy’ Hand Drawn Vector Design Elements in the full pack! Flourishes, curls, corners, borders, wreaths, leaves, flowers, mushrooms, birds, bugs, hearts, stars, feathers, arrows, and so much more. 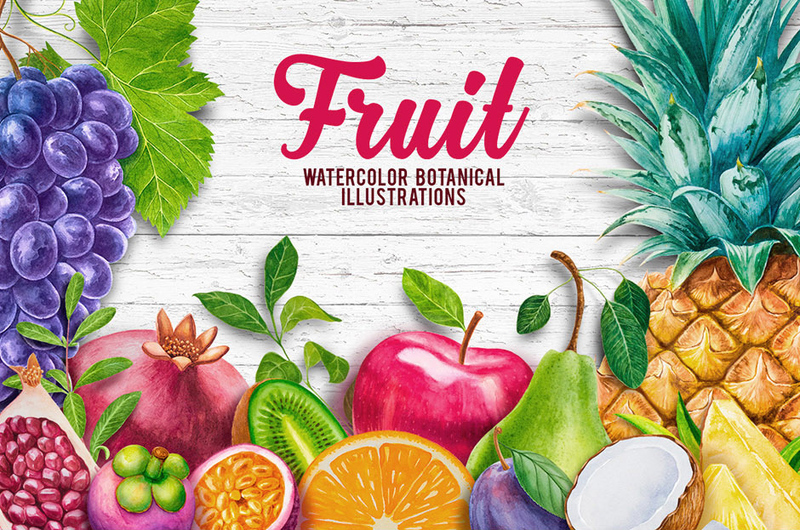 These illustrations are so versatile, and can be used for a multitude of projects including logo, card, digital scrapbooking, invitation, packaging, branding and web design. The possibilities are really endless! Thanks to Kite Kit for participating in this $1 bundle. Click here to visit their store. Set of 16 original vector snowflakes + 5 seamless patterns. Perfect for your personal use or small crafts business. Thanks to My Creative Land for participating in this $1 bundle. Click here to visit their store. A set of more than 40 Christmas badges and elements. You will need Adobe Illustrator or Adobe Photoshop to edit text. For Adobe Photoshop users: note, most shapes are Vector Smart Objects and while you’ll be able to edit their colours you won’t be able to edit the actual shapes. Text is editable so you can use badges not only for the Christmas season! Before use, make sure you have downloaded and installed all fonts listed in fonts .RTF. Thanks to Marish for participating in this $1 bundle. Click here to visit their store. 20 geometric, line art snowflakes set of icons, perfect for modern Christmas designs. Every icon is editable and you can easily adjust and change a thickness and color of the lines. Thanks to Peace ART for participating in this $1 bundle. This set of high-quality hand painted watercolor magnolia elements in Boho style. Perfect graphics for DIY, wedding invitations, greeting cards, quotes, blogs, posters and more. Thanks to Unember for participating in this $1 bundle. Click here to visit their store. Burned Smart .PSD is an easy-to-use Photoshop file which enables you to achieve handsome burned paper effects instantly. Drop your design inside Smart Object and save, the smart .PSD will give you results in seconds. All textures were handmade by me with fire. The .PSD is light weight with a fast result – no additional action is required besides placing your design inside the smart object and drag & drop the burned texture and save. Thanks to Offset for participating in this $1 bundle. Click here to visit their store. 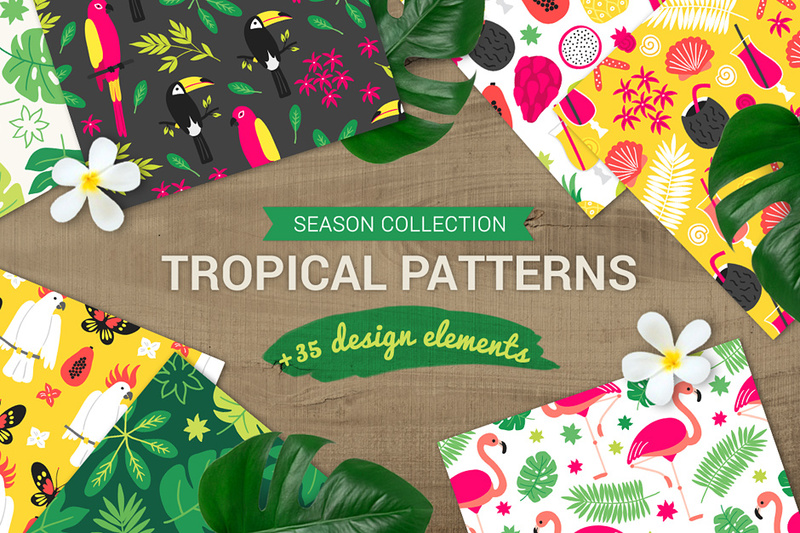 A variety pack containing 16 individual textures and graphic elements. 16 individual vector designs supplied as Illustrator 8.0 .EPS files which are compatible with most vector and bitmap applications such as Adobe Illustrator and Photoshop. The individual designs in black are supplied as high resolution transparent .PNG files, measuring 420 x 420 mm, 4961 x 4961 px, 300 PPI. Thanks to MixPixBox for participating in this $1 bundle. Click here to visit their store. Silver set of lights overlays, in an atmospheric silver bokeh style. Thanks to Blixa 6 Studios for participating in this $1 bundle. 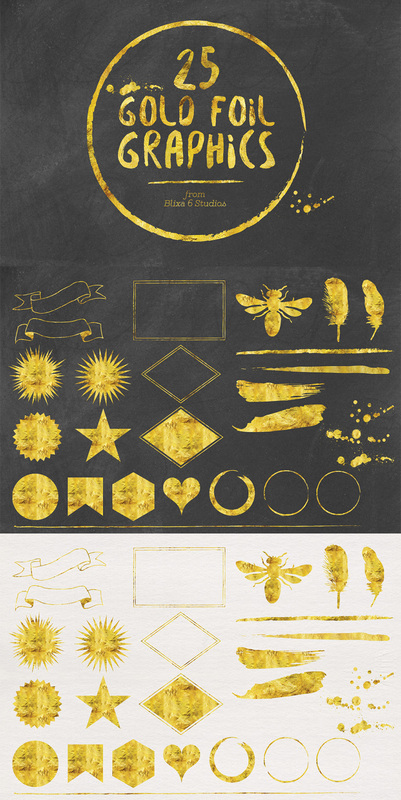 Add some glamour to your next project with these gold foil graphics. Choose from classic shapes like banners, feathers, frames and stars or add a hand painted touch with your choice of many swaths, lines, messy circles and splatters. You can use them for print or web designs, create patterns or embellish your next party or wedding invitation. Thanks to Zeppelin Graphics for participating in this $1 bundle. Click here to visit their store. After our awesome success with our Logo Creation Kit Bundle Edition we decided it was time to create a proper logo creation kit for Her! We created the elements, pre-made logos and textures to feel as feminine and as professional as possible, and here is our taster kit! This sample kit is perfect if you need a logo for your new brand to use on prints or your own blog! We included a selection of vector shapes and textures for you to play with and if you prefer pre-made templates, then it’s a match!, because you will find several ready to edit and use as logos inside the download! • All logos are placed in a single file (editable file included in .AI and .PSD formats). You must simply copy or duplicate the one you wish to use in a new file. • All text is editable and the fonts used are free or free for personal use. You must use the links we provided in your browser to download and install the fonts. This bundle includes hundreds of popular, design resources for just $1! It's our way to say thanks for all your support and loyalty throughout 2016. :). We've focused on quality and quantity with this bundle. These items are very popular, even at full price. 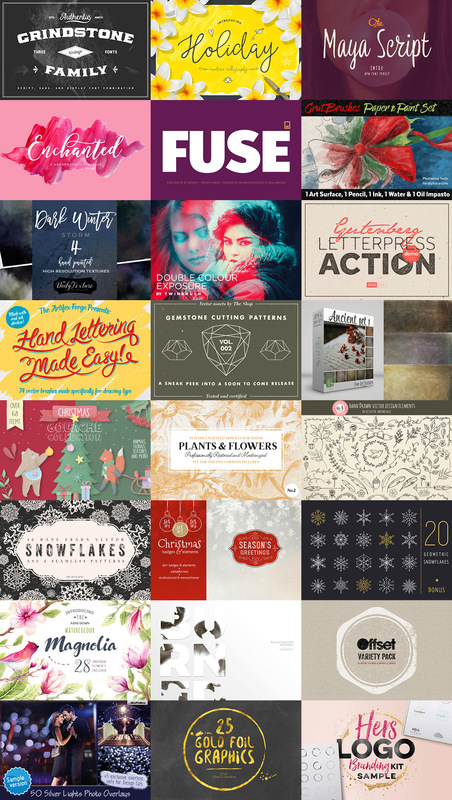 Enjoy your $1 End-of-Year Celebration Bundle from all of us at Design Cuts! File size is approx 1.8GB (3.03GB unzipped), split into 24 parts or an optional one click download. I’ve been wondering why I haven’t heard from you guys for a while. Digging through my emails I found this offer. Awesome offer! I missed out big time..
Can I use some of the vectors files to include in my poster design and sell? Thanks so much for contacting us. I can certainly help you with this. In a nutshell Daniel, you will need to ensure that the vectors are being used as part of your wider, original design and not stand alone or ‘as is’ If you are unsure though as to whether your design is ok under our terms, please do send it over to me and I am more than happy to take a look for you! Thanks so much for your lovely comment :). We hope you managed to grab a copy of our End of Year Bundle when it was available! I just updated my operating system to Sierra 10.12.2 and I’m trying to install these fonts using the Font book but all of them are coming up with errors X and even though I choose to ignore the errors and install anyways, they don’t show up. Anyone else have this issue? Anyone have a font organizing software suggestion that’s not too pricey? Thank you so much for your comment, I’m really sorry to hear that you are having some trouble installing the fonts in this bundle! Rest assured, I am on the case. I have sent you an email to assist you and get you back up and running again with your resources! I hope it helps, Melanie, and please don’t hesitate to contact me should you have any other questions. I’m here to help! This is a great bundle. With amazing products. I´m interested in having this but I really miss it, only arrive from holidays yesterday, and just now checked. It´s possible you guys still give a 2nd chance for the people that miss this amazing bundle? Thanks for your comment! I’m sorry to hear you missed out on this deal. This has now expired but I’m sending you a quick email to see if I can assist you with this 🙂 I hope it helps! I am raging that I missed this deal over the holidays! I love all of the products on Design Cuts I had this booked marked over the holidays and came back yesterday and the deal had expired. I hope this deal comes around again sometime in 2017. Do you know when something like this will come in the future? Thanks! J.
I was trying to be less computer tied (and spend more time with the kids while they were home for holiday break) to start 2017. and missed the deal, any hope at a second chance for those of us who missed the deal? Thank you so much for your comment and I hope you had a wonderful holiday break! Aww thank you so much for leaving such a lovely comment! The expiration date has passed. I made a purchase for $ 1. Do you have any additional charges? I hope this helps, and we hope you enjoy your new resources! Please don’t hesitate to contact me should you have any other questions. I’m here to help! Thank you for this excellent deal 🙂 I would especially like to commend Twinbrush, Colour Double Exposure Photo FX on their excellent instruction guide, so clearly and concisely written – if only all vendors could do the same! Thank you again for a fantastic deal. Thanks again, Meryl! If you do have any queries when working with your items please do let me know, I’m here to help! Thank you for your comment 🙂 We hope you love working with these resources! Thank you so much for your comment 🙂 We really appreciate it! We hope you’re enjoying your new resources. Thank you so much for your lovely comment! You are very welcome 🙂 We hope you have loads of fun working with your new resources! I am so bummed. I want to purchase this bundle but someone stole my credit card so the company cancelled it and my new card and number won’t arrive until after the sale is past! Thank you for your comment. Oh no! I am so sorry to hear about your issues with your credit card! We hope this gets sorted out soon for you but in the mean time, I’ve popped you an email to assist you with this. I hope it helps! Whenever I try to checkout it says ‘ERR_TOO_MANY_REDIRECTS’…and it seems I’m not the only one having this issue. Please fix this there’s less than 2 hours left and I would really like to grab this incredible deal. If possible, please extend the deal. Thank you so much for your comment! We’re really sorry for this small blip on our side but it’s great to hear that you were able to pick up this bundle 🙂 Thank you so much for your purchase! We really hope you’ll enjoy your new resources and will get loads of use out of them. If you have any queries, please let me know. I am always happy to help! Hi!!! the download it’s not working. Can you help me? I delete all the cookies fallowing the instrucctions but nothing happened. Thank you. Thank you kindly for your comment! I’m so sorry for this inconvenience when purchasing your bundle. Rest assured, I am on the case to get you up and running again! I’ve sent you an email to get some more information from you and assist you with your purchase! when i click ‘check out’ it says, the page is not available. could you please advise? It’s all sorted. Thanks for the awesome deal! Thanks for your comment! My apologies for any delay caused when picking up this bundle! I’m pleased to report that we have fixed this issue and I can see that you were able to add this pack to your account 🙂 Thank you so much! We hope you enjoy working with your new resources and if you have any queries when working with them, please do let me know. I’m here to help! I can’t buy this because I suffered redirection error.. how to buy this? Thank you for your comment! I’m really sorry for any inconvenience caused when purchasing this bundle. We unfortunately had a small blip on our server yesterday which was causing a redirect but this has now been rectified and I can see that you were able to pick up this pack 🙂 Thank you so much for your purchase! Apologies again for any inconvenience, Yunsoo, but we hope you enjoy working with your new resources! If you have any queries, please do let me know. I’m here to help! Oh my, i can’t checkout. Thank you for your comment, I am so sorry that you were having an issue purchasing your items- we had a small blip on our server yesterday that was causing a redirect but I’m happy to report this has now been fixed! My apologies that this was initially affecting you but I can see that you have been able to proceed with your bundle 🙂 Thank you so much for your purchase! I really hope you’ll enjoy your new resources and will get loads of use out of them. If there is ever anything I could assist you with please do let me know. I’m always happy to help! When I try to buy this product, the message says that the number of redirects is high and can not be purchased. Thank you for your comment! I’m so sorry for any inconvenience caused when purchasing this bundle! We had a small issue with our server yesterday but thankfully we noticed that it was causing a redirect and were able to fix this! My apologies again for any inconvenience caused but rest assured, I am on the case to make sure you can get up and running with this bundle! I’ve sent you an email to assist you with this! And now, this! This is a win win! Great motivation for me to learn and create. Thank you! Thank you for your incredibly kind words and thank you so much for your first purchase with us! 🙂 We are so grateful for your support and we hope that these resources make an awesome addition to your creative toolkit. Thanks again, Reyselle. Happy Designing! Thank you so much! Happy New Year! You are wonderful team! Thank you for your kind words! You are very welcome 🙂 We hope you love working with all of these resources! Thank you so much for your lovely comment and thank you for your purchase! We hope you had a wonderful Christmas and New Year and are now settling down to enjoy your new resources 🙂 If you do have any queries when working with them, please do let me know and I will happily lend a hand! when i saw this deal, my jaw nearly dropped! you guys are amazing! thank you so much for all that you do. happy new year!! Thank you so much for your lovely comment and we are so happy that you like this one :). It is just our way to say thank you for sticking with us this year! We hope you love working with your new goodies and Happy New Year from the whole team! Thanks for the comment and I can definitely help you out on this! Please do note though that there are restrictions regarding apps for mobile phones so I would need to find out a little more about your intended project to ensure you are within the terms of the license. I have popped you an email to help out further. Happy Holidays Hema to you too! We are so pleased that you are enjoying the Celebration bundle and it is just our way to say thank you for everyones support over the past year! We hope you get loads of use out of your new resources! Amazing products from such talented designers. As I only have PSE 11 there are a lot of the wonderful elements I can’t use. More PSD files or PNG would be wonderful, but I thank you for everything. Thanks so much for your wonderful feedback. We hope that you will get loads of use out of the resources that will work well for you! You folks are simply Amazing! I checked out another $1 Holiday Bundle of design assets and it was filled with all sorts of things that held no appeal for me at all. It was a pretty unattractive collection of items I wouldn’t even want on my hard drive. But THIS bundle is completely different. This bundle is filled with useful fonts and design assets and is a real gift for only $1. I even have project which will make good use of those 2 sets of snowflakes. I’m very pleased with this. Thank you so much for all your amazing deals, and I’ll look forward to seeing what you bring forward in 2017. Happy holidays! Your kind words and support are very much appreciated. We are super excited for what the new year has to bring, so from all of us here at DC we wish you all the best! Thanks for the cool design resources – I’ll be buying this one for the fonts & vectors. Thanks so much for your lovely comment and we hope you get loads of use out of your new resources :). Thanks so much, I love your guys’ stuff, and I’ve been kicking myself in the head for not being able to buy your Quality Font Collection Deal a couple of months ago. This is great and has a lot of nice fonts. Thanks again. What a great deal. I love this site. Thanks so much!! Thanks so much for the lovely comment! We are so happy to hear you like this one :). We hope you get loads of uses out of your bundle and Happy Holidays from the whole team! This is fantastic!! 🙂 Your deals always amaze me! Never buying fonts from another site again. Wow- thank you so much for your awesome comment! We are so happy you like this one and high praise indeed :). We love to make our deals as bespoke as we can so please do let me know if there are any fonts you would love for us to try and feature for you! Oh wow! Thank you so much and happy holidays! Looking forward for another awesome year with DesignCuts! You guys are THE BEST! Oh thank you so much for your amazing comment! Merry Christmas and Happy New Year to all of you and each and every designer whose products you sell! I've never been so happy with your digital products. Makes designing everything I do a total pleasure. You're the bestest! Merry Christmas to you too and we hope you had a lovely time over the weekend! Reading your comment has definitely made my day over here so thank you! We are so happy that you are loving your DC resources and that they are helping out with your work- we absolutely love to hear that :). Have a wonderful New Year and thank you for all of the support throughout the year! All things Merry & Bright to the Elven Makers & Purveyors of Graphic Greatness & Generosity! What goes around, comes around…may your 2017 be an eye-popping-super-stellar-chart-busting hit! This wonderful feedback has absolutely blown us away and we cannot thank you enough for your support. Amazing deal, Grindstone alone is worth it!!! I can’t believe you could make this one happen, thanks again. Thank you so much for the amazing feedback- it means so much to us all! Happy Christmas to you from the whole DC team! I’ve just purchased this bundle along with the vintage one and MANY items from the marketplace. 😀 Thank you so much for outdoing yourself every single time and for making us happy. I wish you lovely holidays (you deserve it!!! ), merry Christmas and happy New Year! Thank you so much for your lovely comment and your purchases- we really appreciate your support! Thank you to all who have contributed to this!!! What a wonderful Christmas treat! Love your bundles and cannot wait to see what’s coming up next Year… Happy Holidays, Design Cuts Team! We really hope that you will learn something new and pick up some cools tips and tricks from our upcoming bundles. If it doesn’t hurt, can i ask that this files are shareware? Thanks for the comment and we are glad you like the way we have split the bundle up! I am not too sure what you mean by shareware but all of our bundles are single user only so you are not allowed to share them as per our licensing terms. If you have any questions though, please do let me know! woooooooooooooooooooooooooooa muchas gracias, este regalo estuvo genial y ya está en mi cesta! muchas gracias a cada uno de los diseñadores por regalarme sus creaciones! Thank you, thank you, thank you. What a wonderful way to end the year. One of those thank yous is for the designers who contributed to this lovely gift. We will be sure to let the designers know what amazing feedback they have received. Your continued support is very much appreciated by us all. Thank you so much! You’ve make this fontaholic very happy throughout the year. Wishing you all the best in 2017. As fellow fontaholic’s this makes us very happy! We hope you have a wonderful new year! Everyone has already said what I was thinking except WOW. Thank you DC. I am just a simple hobbyist. We super appreciate your support and want to wish you a very Happy holidays. Thank you very much for this wonderful bundle — thanks to you from Design Cuts and thanks to all the designers who are involved in this deal. I wish you all a Merry Christmas and a Happy New Year! Thank you so much for sending such warm wishes to the team and the designers that we work with! Thanks for this amazing bundle at an amazing price! It’s a Christmas gift indeed. Merry Christmas & Happy new Year to the wonderful Design cuts team!! Your support means a great deal to the whole team and I. We are super glad you like this one and we hope that you’ll get loads of use out of it. Wait, no it’s not; Merry Christmas and Happy New Year. What a wonderful bundle, you guys are insane, but I’m not complaining, 🙂 Thank you to the DC team and to all the contributing designers. I know all the designers who took part were super excited to share this with you all, so we are really glad you like it. Thank you for this amazing gift!!! Merry Christmas and Happy New Year everybody!!! As always a wonderful set of graphics and tools. Thank you so much for bringing together such talented designers. It makes getting premium resources so much easier. Happy holidays to all. Happy Holidays… you all keep making some amazing things happen in 2016, see you in 2017. Thanks so much for the awesome comment and lovely feedback! We hope you have the best holiday season and that 2017 brings you all that you wish for. The most INCREDIBLE gift for myself. Thank you sooooo much. We hope you love working with your new items and thank you for all of your support! It means the world to us! I love it!!! Thank you! Merry Christmas DC team! Stay awesome! We are so happy that you love the bundle and Merry Christmas to you too :). Just fabulous….you guys are the dogs doo-dahs!! Please help me spend more in 2017!! Have a wonderful break and can’t wait to see what next year has in store..mwah! Ha this comment is awesome and thank you for all your support this year :). This bundle is our way to say thanks! Rest assured, we have some really big plans for 2017 so we wish you an awesome festive break and roll on even more fun in the New Year! As others have already said..your customer service puts you head and shoulders above everyone else! Very nice celebration bundles i saw ever. I found this pack via twitter bcuz an user posted this offer in her tweet 😀 I’ll use this bundle usefully. Thanks a lot and have a great holidays xD! Thanks so much for the comment and welcome! We are delighted you have found us :). We hope you get tonnes of use out of your new resources and if you have any questions, please do let us know- Team DC are always more than happy to help! Happy Holidays :). Thank you, and happy holidays to all the talented designers who have contributed to this bundle as well as to all our hard working Design Cuts staffers. It’s another wonderful collection of resources to close out a great 2016 at Design Cuts. Thank you for your lovely comment! We are so happy you like this one and thank you so much for all of your wonderful support this year! It is always lovely to get to talk with you :). On behalf of the whole team, we want to wish you a very Merry Christmas and Happy New Year! We hope that 2017 brings you even more inspiration! Thanks so much for commenting and we are huge fans of Julia Dreams as well and we are so happy she was able to be included in this bundle! We would love to see anything that you create with your new items so please do feel free to pop us over any of your work! Merry Christmas from the whole team here :). This is AWESOME!!!! Thank you so much!!! Merry Christmas everybody!!! Thank you so much for your lovely Christmas wishes! You are more than welcome for the bundle and we hope you get loads of use out of it :). Happy Christmas to you and yours from Team DC! Not a problem Karen! We are so pleased you like it :). This is Excellent! Thanks So Very Much!! Wishing You All The Merriest Christmas and a Safe-Happy-Healthy New Year!! This bundle is actually ‘free’! Thanks to all at DESIGNCUTS and Merry Christmas! Thank you so much for your lovely comment! It’s not quite free but almost :). 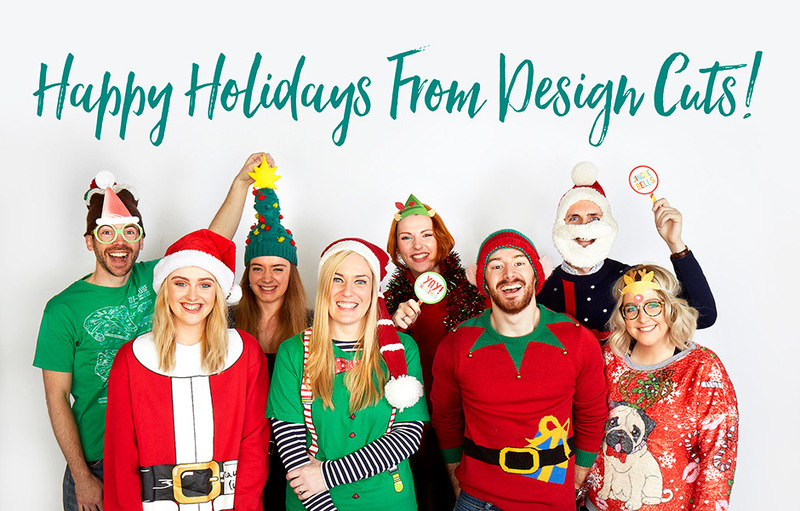 Merry Christmas to you too from the whole Design Cuts Team and happy designing! Happy Christmas to you too and you are very welcome! Thank you for all your support this year and happy designing with this one :). You guys have truly outdone yourselves. What a generous and fun-packed collection! Thank you and Merry Christmas! We have been so excited to launch this one and its been so hard keeping it secret :). We really hope you get loads of use out of this one and Happy Christmas to you too! You can’t get better value for $1 anywhere! Have a FANTASTIC CHRISTMAS and a BRILLIANT NEW YEAR! We are so happy to hear you like this one and hopefully you get lots of use out of your new resources :). The whole team send you Christmas Wishes and thank you for your support this year! ABSOLUTELY FANTASTIC EOY Bundle!! DC Team certainly will keep me dancing by snowing me happily with this bundle. Love you all !! Thanks so much for this bundle and thanks to all the contributors for it. This is definitely the best $1 deal for me. As always, a full 5-star (and this is AFTER I hit the button below – ATC now. No longer BDN? LOL) . Have a wonderful Christmas holidays to DC Team and to all DC Members, and HAPPY NEW YEAR 2017 from me!! Thank you, designers and Design Cuts, for the lovely present which I immediately snatched up and will spend my evening exploring! Merry Christmas, Happy Hanukkah, Joyous Kwanzaa, (productive?) Boxing Day, Happy Festivus, and a Prosperous New Year to all! Whatever makes your holiday season merry, I hope it finds one and all in good health and surrounded by love. You are very welcome! Have an awesome time working with your new resources :). I love your comment and the phrase ‘steal of a deal’ From the other comments, I think our community would agree with you :). We are so happy to hear that you like this one and hopefully you will get loads of use out of it! Happy Holidays from the whole DC Team! Thank you so much for your kind words! A very Merry Christmas to you too from the whole team at DC 🙂 We hope you enjoy working with your new resources! Yesterday I was cleaning up some old folders and documents when I came across last years “End-of-Year” DC gift… COMPLETELY UNOPENED …because it was wrongly placed in an old client’s file. I spent the rest of yesterday excitedly going through the 2015 goodies of fonts, mockups, filters, and art. Lo and behold, your End-of-Year DC bundle comes today. I feel I just got two gifts from you all. Thanks Santa! Thank you so much for your comment! That is amazing timing that you came across our End-of-Year bundle from last year as we release this year’s collection 🙂 we hope you enjoy this double up of Christmas goodies! Thank you so much for your comment! We’re so pleased to hear you are loving this bundle 🙂 thank you so much for your purchase! We hope these items make an awesome addition to your creative toolkit. this great deal possible including the whole Design Cuts Crew. it up with the great work. Happy Holidays, I wish you the best for you and your families. Can’t believe I’m the first to say it, but “I’d buy THAT for a Dollar!”. So I will. Thanks team DesignCuts – and for a stellar year. Think I only skipped a couple of your deals this year – and that wasn’t a reflection on the quality, just my needs. Top stuff – keep it up – and Happy Holidays to the team. Thanks so much for your continued support throughout this year. We really appreciate it! The whole team and I wish you a very Happy Holidays to you too! PURE AWESOMENESS !!! Thank-you Design Cuts and to every single designer & contributor to this unbelievably TRUE DEAL !!! Merry Christmas & Happy Holidays to everyone there at the DC office, all contributing designers selling great resources through DC and to all of the DC Ambassadors – Best Wishes to All…..
P.S. I should be back here tomorrow to pick up the new VINTAGE BUNDLE too! Better get my downloading hat back on soon!!! Thank you for the awesome comment and kind words to all the designers that we work with! Oh wow, you guys are AMAZING .. thank you very much!! I love it!! Fantastic bundle! Merry Christmas! We are so pleased you love the bundle and its just our way to say thank you for being a part of our community- we think you are pretty amazing too :). Have a wonderful weekend and a happy, design filled New Year! My goodness, you are such a wonderful company! I love being part of the community you have built. Thank you so, so much for this $1 bundle! It’s amazing!! Merry Christmas to each of you! I look forward to seeing your business grow and prosper in 2017! Thank you so much for your kind words and we are honoured to have you part of our community! We are really happy to hear that you are loving our festive treat and we hope you get loads of use out of it! Rest assured we have loads more fun things planned for 2017 which we cant wait to share with you but until then, Merry Christmas to you Judi from all of us here at DC HQ! MAHALOS! For this wonderful gift … sending out our ALOHA along with all the other people whom you have helped with their creative hurdles. Thanks again, Rogerio! A very Merry Christmas and a Happy New Year to you too! Тhank you so much! Merry Christmas! Thank you so very much for such a wonderful Christmas gift. Wishing the best to all of you throughout the holiday and the new year ahead. Can’t wait to see what you have in store throughout 2017. Thank you so much for your kind words! We really appreciate it 🙂 We hope you have a lovely time over the holidays and we wish you all the best for the new year! Thanks for your lovely comment 🙂 It’s great to hear these resources will bring you loads of fun over the holidays! We hope you enjoy working them all! Merry Christmas to you too, Michelle and rest assured, there’ll be some more awesome bundles coming swiftly in the new year 🙂 if you do have any items that you’d love to see please do let me know and I’ll do my best to source them for you! Thank you so much guys. DC is setting the bar of how to do business- best of the best product selections, generous giveaways, excellent customer service, great community building. You guys are the bomb!. Thanks again for all your hard work and enjoy a Peaceful Christmas and very best wishes for a Wonderful New Year to you and yours. Thank you so much for your lovely comment 🙂 it really means the world to me and the team to have your support and we are thrilled to hear that you are enjoying your experience as part of the DC community! My thanks to the whole Design Cuts gang, and to each artist who participated in this Celebration Bundle! May each of you, and your loved ones, enjoy health and safety throughout the coming New Year. Your kind wishes for the new year and continued support mean a great deal to the whole team and I.
WOW, what a delightful surprise…!! Having come in to purchase your current Vintage Design Bundle, I am now adding this incredible Celebration Bundle to my order, making it an even $30 — and that makes me one happy camper, lol. Many thanks to you wonderful peeps — I appreciate you so much, and hope you all have a very Merry Christmas! Whoops, inadvertently left out the well-earned FIVE STARS when I commented — so here you go! Thank you so much for your comment and purchases! And this is why I do not look anywhere else when I need something. You guys are THE BEST! Thank you for this incredible year of great things to make us all buy. Well you don’t actually make us, but you make it so that we want to buy them. I cannot wait to see what next year brings from you guys and your fabulous team. We love, love, love you guys and wish you a very Merry Christmas and Happy New Year from our team to yours! Oh thank you so much for the incredible feedback! We cannot thank you enough for your kind, kind words. Your support means so much to us all here at DC and we really appreciate you taking the time to leave such a wonderful comment. Thank you so much, Claudia 🙂 we really appreciate it! Thank you so much for your kind words! It’s great to hear you’re liking this bundle 🙂 we hope you enjoy working with it! If you have any queries or if there’s anything I can help with, please do let me know. I’m here to help! You guys are simply the best. I can never say enough good things about all of you at DC, and this bundle is such an example of your goodness. I instantly purchased this bundle (Merry Christmas to me! ), and imagine many will do the same. It is a superb bundle with loads of amazing products. Thank you so much for transforming the way I create my work. I feel so fortunate that I get to be part of the DC community. Merry Christmas and here’s to an even better and brighter 2017!!!! Thank you so much! That is incredibly kind of you to say and we really appreciate it 🙂 It’s an absolute pleasure to have you as part of our community and we look forward to talking to you more in the new year 🙂 In the mean time, we hope you enjoy working with your new resources. Thank you so much for your purchase! Thanks again for your amazing support, Katie! We all wish you a very Merry Christmas and a wonderful new year! Every time I swear to go on a DesignCuts diet, you make something irresistible available. You offer us amazing value and introductions to so many talented designers. Thank you! Thank you very much!! I love it!! This bundle is fantastic. Thank you so much! 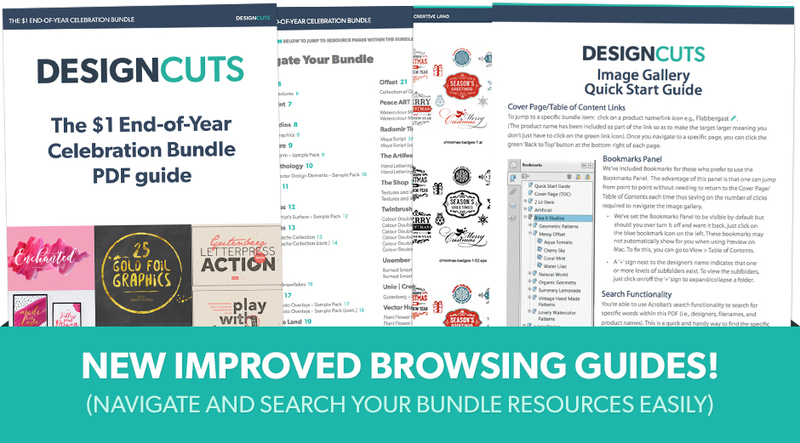 It’s fantastic to hear that you’re loving this bundle 🙂 We hope you enjoy working with these resources! awesome products for awesome price 🙂 Great deal! Thank You very much and happy holidays! It is awesome to see that you are loving the products in this one and a very Happy Holidays to you too! Again and again … thank you so much, it´s lovely to work with you and your resources! Enjoy your holidays, and peaceful cosy and happy christmas days, and have a great New Year! A very Happy holiday to you too and a great start to the new year. Wow. HOhoHO…and a great X-mas and a lovely 2017 to you all. Thank you very very very much! Thank you so much for your lovely comment! You are very welcome 🙂 We hope you love working with your new bundle items! Love, love your holiday group photo. What a bunch of cuties!!! Thanks so much for the amazing packages you offer (and your videos). Yours is the one email that I’ll drop everything to open. This end-of-year bundle is just super. AND, a giant thank you to all of the vendors who participate in your bundles . . . making our lives more beautiful! We are so glad that your loving the DC bundles and videos and we feel super special knowing that you open our emails as soon as they come through! nice one, thanks. Merry Christmas! Thank you so much for always generous bundle! love you! Merry Christmas to all of you! You guys never cease to amaze me! What a wonderful Christmas present. 🙂 The first thing I fell in love with was the Christmas Gouache Collection – that is adorable. I’m also a sucker for star charts & maps. And of course who doesn’t love fonts fonts fonts! Thank you SO much. Merry Christmas, Happy Holidays. Thanks so much for your awesome comment. I hope that you will love working with it over the festive season- Happy Holidays! Thank you so much! It’s great to hear you are loving this pack 🙂 We hope you enjoy working with your new resources! If you ever need a hand with anything please do let me know. I’m here to help! Thank-you for another wonderful year of assets I can put to work the instant they are downloaded. Every time I get an email a new bundle is out, I do a happy dance. Best wishes for the new year! Oh thank you so much for the lovely comment. I can picture the dance right now 😀 we hope that you continue to love working with your resources and that the new year brings lots of creativity to you! And now for the serious comment. You guys deserve all the best! Your company built a win-win business model, with an incredible customer service and an expert and friendly staff. I wish you a new year full of peace and happiness and even greater success for your company! Please don’t wake me up, I’m dreaming of a 1$ bundle from those golden guys at Design Cuts. Haha! Thank you so much for your awesome comment, Fabio! 🙂 It’s great to hear you’re enjoying our end of year bundle! Love this, thank you so much. Off to share on Facebook now. Thank you so much. Spare your good wishes for Christmas and I wish you a new year full of satisfactions. I accept with gratitude your generous gift, but only by adding some additional artwork from your site to the regular price. A hug to all of you. Thanks so much for your kind words Alberto! Thank you for always offering well-curated, great quality materials. Happy holidays to all of you wonderful, hard-working, talented, and awesome people. Thank you so much for leaving such an amazing comment! The team and I super appreciate your support and we are really glad that you have been loving your resources so far. Thank you so much for your lovely comment! It really means the world to me and the team 🙂 We hope you enjoy your new resources and we wish you a very Happy Holidays and all the very best for 2017! Can’t wait to see what you guys have coming for the new year ahead!! Merry Christmas and Happy New Year from Ginkelmier (that’s me, lol) to everyone at Design Cuts! !